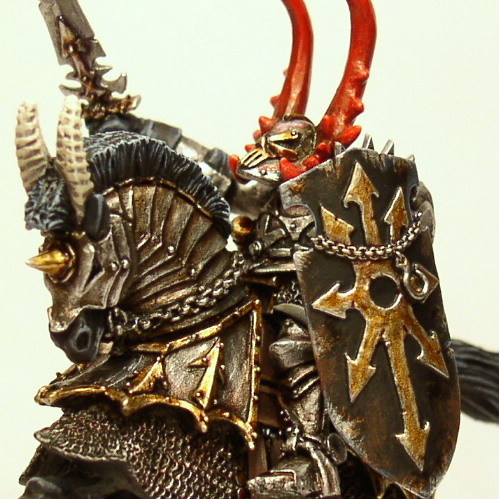 Chaos Black basecolour highlighted with Shadow Grey followed by Space Wolf grey on the very edges of the shields. The gold was painted using a basecolour of Shining Gold washed with a 2:1 Purple/Chestnut ink mix and highlighted adding Mithrill Silver to Shining Gold. Finally the Gold areas were given a thinned down glaze using a mix of Tamiya Clear Orange, water, a brushtip of dish-soap, and a brushtip of Chaos Black. The weathering was done by painting the metal scratches first with Mithrill Silver. 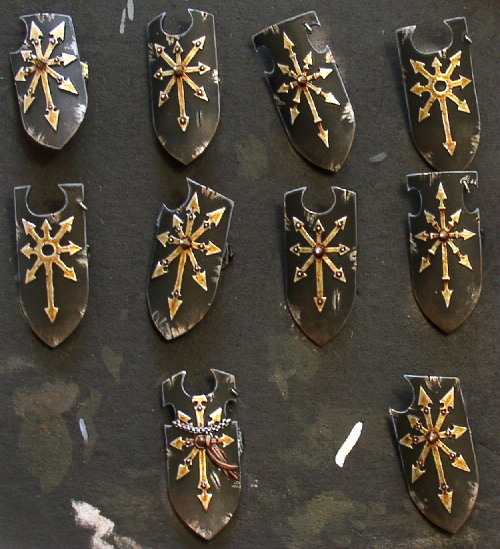 Then the black part of the shield was washed with thinned down Chestnut ink in a somewhat random making sure that some of the metal scratches were partially covered. Finally the lower half of the shield was carefully drybrushed or stippled using Scorched Brown.